I wish I’d been born in the era of silent movies. Being able to listen to my iPod while watching a film at the same sounds wonderful. 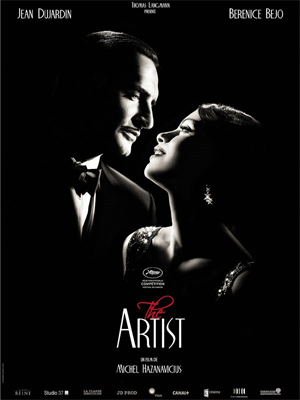 ‘The Artist‘ is a French film but I wouldn’t hold that against it. It was directed by Michel Hazanavicius and stars Jean Dujardin and Bérénice Bejo. What is specifically interesting about this flick is that is a silent movie. Hazanavicius seems to have a fascination with the 1920s silent films and has finally earned enough street cred (through spy films no less) to convince backers to sponsor his fantasy. The story is set in the late 20s and revolves around a famous actor accidentally discovering a girl and bringing her fame and fortune. As expected, the actor’s glory starts to fade while the girl’s continues to rise. I doubt there will be anything new in the story, it is the mere fact of a silent film being made in the 21st century that makes it so appealing. Rotten Tomatoes is currently giving it a 97% which is an incredibly impressive score. Of course it may be a case of reviewers being too frightened to comment negatively on an experimental film such as this but time will tell. It first appeared back in May 2011 at the Cannes Film Festival but isn’t due to appear in Australia until the 2nd of February, 2012. This entry was posted in Film, Reviews and tagged silent film, the artist. Bookmark the permalink.